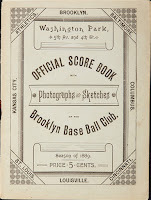 This scorecards is one of the earliest artifacts of its kind from the Dodgers franchise. 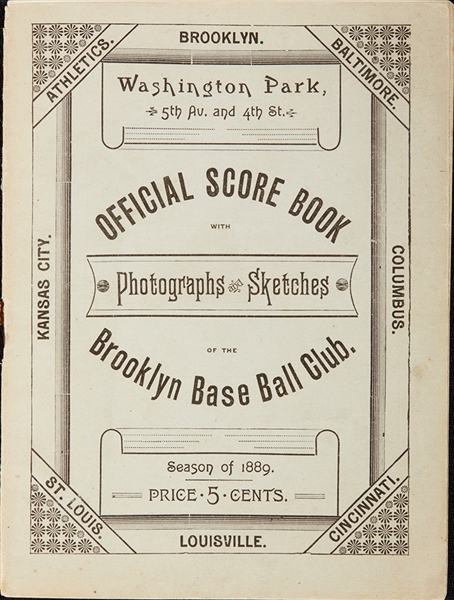 Best yet, Goodwin & Co. auction house was kind enough to share pics of several of the pages within it in their auction listing. I've captured all of those photos below, and included the biographies created for each individual player so that you may learn a little bit more about a few of the earliest Dodger players. Since the pics provided aren't particularly clear I've done my best to recreate them. Check out these pics and biographies below the fold. 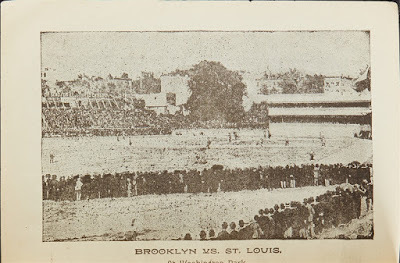 As you can see below, the club was playing their games at Washington Park; their very first home and onetime headquarters for General George Washington during the Revolutionary War. I had previously written extensively about this ballpark here. Check out this fantastic 1939 photograph of future Baseball Hall of Famer Jackie Robinson on the football field for UCLA training camp. Photo via the Jackie Robinson Foundation on twitter. Here is something you probably didn't know. 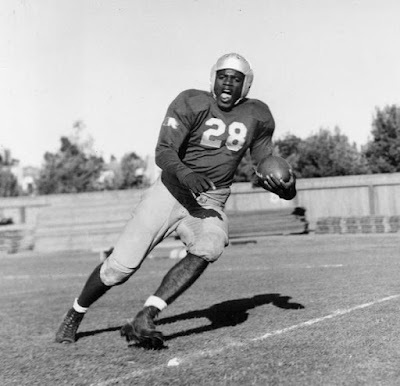 Jackie Robinson, for a brief period, played professional football. In 1941 he played for the semi-professional Honolulu Bears - a racially integrated football team. Then returned to California later that year to play for the Los Angeles Bullfrogs of the Pacific Coast League. As fate would have it, Pearl Harbor was bombed that December and the Bullfrog's season came to an abrupt halt. The following year Jackie would be drafted into the Army. Check out the potential postseason schedule for the Dodgers here. Also Cary Osborne at Dodger Insider lets us know about registration for Dodger playoff tickets, here. I didn't know that! Via Eric Stephen at True Blue LA, "3 straight postseason appearances would be a Dodgers franchise first." Sounds ridiculous, but it's true. Dustin Nosler at Dodgers Digest shares his picks for, "2015 Dodgers’ Minor League Players of the Year." Cody Bellinger is his "Hitter of the Year" and Jose DeLeon is his "Pitcher of the Year." Vincent Samperio at Dodgers Nation notes that a Dodger milestone that was just broken, "Justin Ruggiano, Scott Schebler Join Record Book." The consecutive leadoff home runs were the first time that has happened since 1951, when Carl Furillo accomplished the feat on his own against the Chicago Cubs as a member of the Brooklyn Dodgers. As a part of today's commemoration of September 11th the entire league will be wearing special caps with a stylized American flag on its side. See the Dodger cap on the right. Go here to check out and order a cap from New Era. All MLB proceeds from sales of these caps will be donated to the 9/11 Memorial and Museum, the Pentagon Memorial and the Flight 93 Memorial. 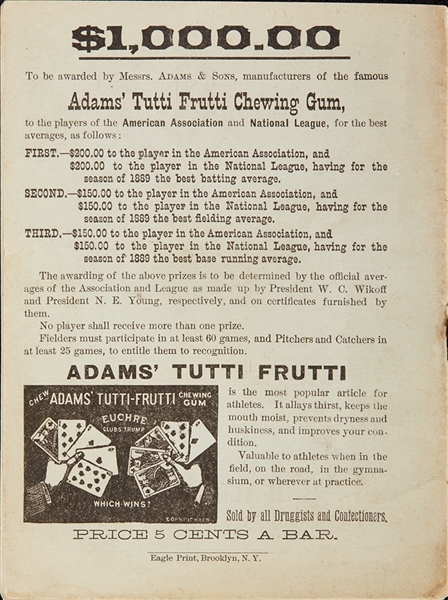 Bill Plunkett at the OC Register shares some quotes from some Dodger players about the city's ban on chewing tobacco. “Good. Ban it. 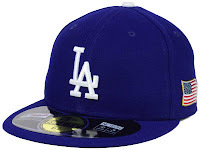 Do me a favor,” said Dodgers reliever J.P. Howell, a dedicated tobacco user since his college days. 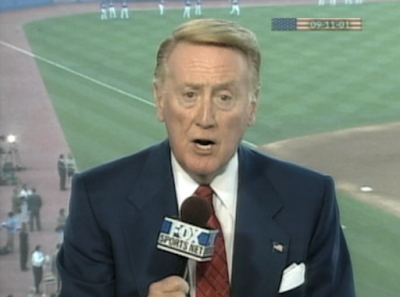 Via Eric Stephen at True Blue LA, "Justin Turner voted Dodgers nominee for 2015 Marvin Miller Man of the Year award." Honored to be voted by my teammates to represent the @Dodgers for the #MarvinMiller Man of the Year award!